"Zeke Boniface wears winter underwear all year long. The reason we know is that in summer he doesn't wear any shirt. You can always tell how long he's had the underwear on by the different color that shows at the beltline when he bends over to pick something up. The top two buttons are always unbuttoned and the hairs of his chest stick out there. "But Zeke runs the most wonderful junk yard in the world. You can find anything if you look long enough." 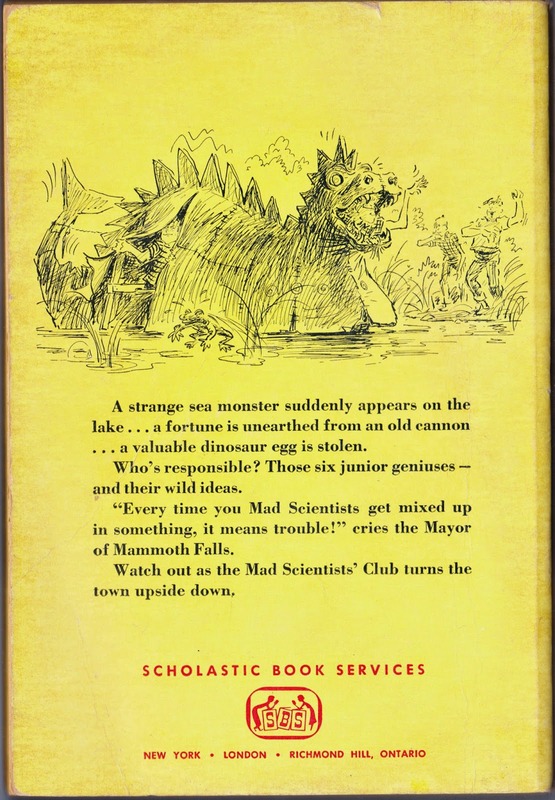 Notes: Some of Brinley's tales of The Mad Scientists' Club first appeared in Boys' Life, the official magazine of the Boy Scouts of America, before being gathered together for this book in 1965. ... There were eventually four books about the Mammoth Falls gang, and they were collected in a 619-page omnibus paperback from Purple House Press in 2010. ... For the dedication on this Scholastic Book Services edition, the author writes: "These stories are dedicated to all boys — who like to dream about things they would like to do — and to my agent, Carl Brandt, without whose constant prodding I would never would have written them." ... There is a website dedicated to The Mad Scientists' Club; it is maintained by his son, Sheridan Brinley. ... Illustrator Geer, according to his biography on Wikipedia, grew up on Long Island, served with the U.S. Navy in World War II, wrote and illustrated some of his own books, and like to draw the distinct Mansard roof. 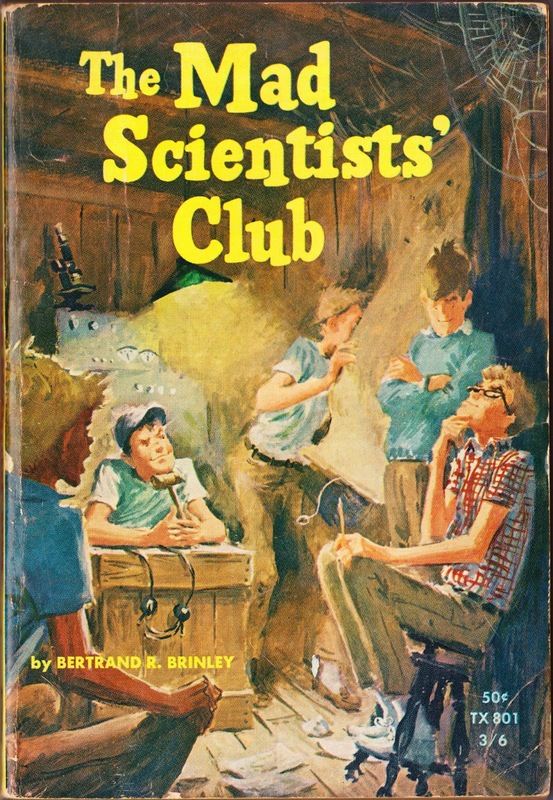 NOTE: When I was originally writing this post, I accidentally typed The Made Scientists' Club. That's a much different, sadder book. At the end, all of the scientists are escorted into an empty room and shot in the back of the head. Then Robert De Niro wrecks a pay phone and cries.